A reinvented Diva MagTek, the Rossignol Diva LF snowboard is all new this year and ready to knock to your boots off. It's a true twin freestyle board that can shred everything on the mountain. Lite Frame technology is used to provide full-length shock absorption, playfulness and to give you ultimate ride control. Its Lite Wood CBF2 core features Basalt and Kevlar fibers along the edges for incredible stability at high speeds and increased edge grip. Combined with RadCut sidecuts, an AmpTek Elite profile and Magne-Traction technology, the Diva LF demands attention no matter where you throw it down. This board is the bomb!!!!!. Perfect board for anyone trying to up their game. Love. Responsive, steady, flexy and so cute. 2018 Rossignol Diva LF Snowboard Review by Jenna. 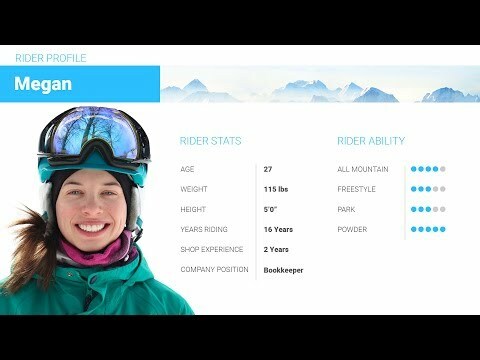 2018 Rossignol Diva LF Snowboard Review by Megan.